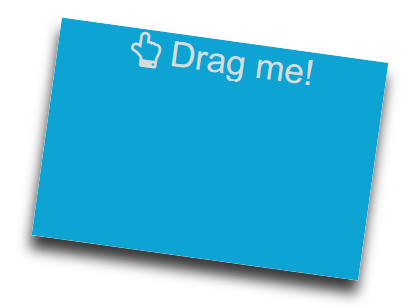 swingdrag is a jQuery UI plugin, which adds a nice swing effect to the jQuery UI drag function. The options maxRotationAngleDeg was renamed to rotationAngleDeg and its default value was set to 8. The size of the deployed jquery.ui.swingdrag.min.js file was reduced. There are performance bugs in some browsers. Indicates whether a pickup-/drop shadow should be shown. The pick up scale factor indicates the size change during dragging.